X'Pert Epitaxy has been developed for materials scientists analyzing problems using x-ray diffraction measurements. 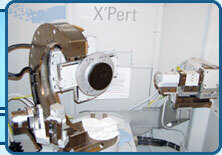 X'Pert Epitaxy is used to analyze data recorded using X'Pert PRO Diffractometers to determine the crystal quality of deposited layers. The thin layers may range from near perfect single crystals (for example: III-V semiconductor laser structures) to textured polycrystalline (for example: magnetic oxide layers).